I have a terrible to, honestly, a non-existent relationship with the dentist which is really quite terrible. My teeth hurt-I'm sure I have cavities and I know I need braces- but I have wrongly convinced myself that I don't need to really go so I don't. Last time I went to the dentist I had to get "surgery" and it wasn't even teeth related. Take advantage of NYU's School of Dentistry's FREE Health screenings on Tuesday, October 23rd, Wednesday, October 24th, and Thursday, October 25th from 8:30am-7:30pm. 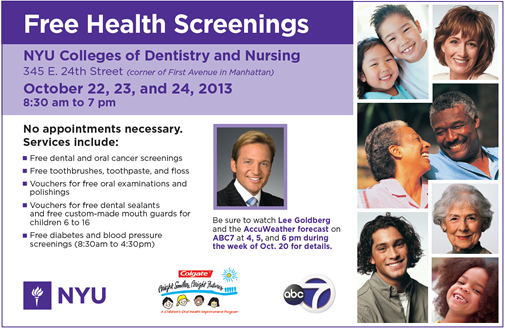 They will be providing free health screenings, tooth brushes and tooth paste, and vouchers!